When the owners of this classic Mt Eden villa purchased their home, they knew that a bathroom renovation would be one of the first things on the agenda. But the space was limiting. Without major architectural changes, we had to work within the parameters of the odd shape of this split bathroom. But the most has been made of a difficult space to great effect and beautiful results! The traditional style of this bathroom is updated with the use of a clean, fresh colour palette. 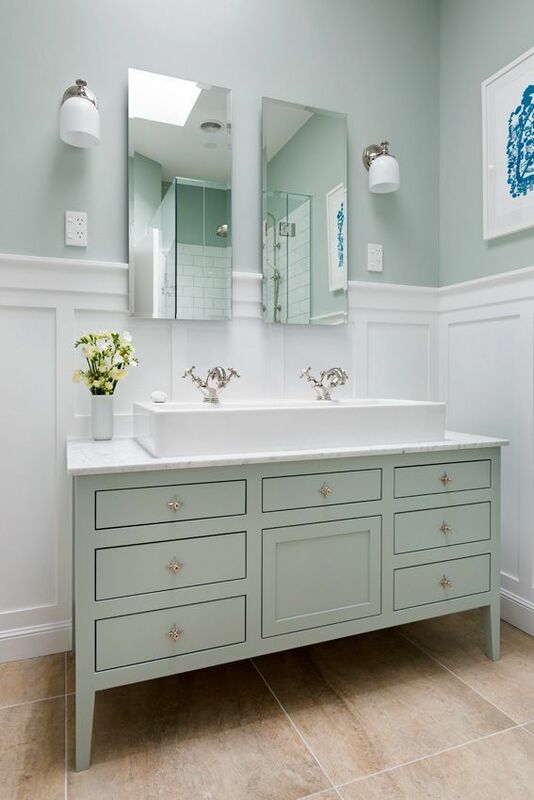 The custom designed vanity, in the same soft green of the walls, is a perfect compliment to the bright white panelling and fixtures. The modern, trough sink is wide enough for two, and the very traditional taps marry the two styles with maximum practicality. To the side of the vanity, recessed cabinets disappear visually but contain loads of storage space. The shower area was challenging as it narrows and angles back, but creative use of space makes this traditional style shower enclosure really special. The glass enclosed walk in shower makes the best use of a small space with a rainhead and hand shower next to a practical bench. To the side of the bench, a large recessed alcove has space enough for all your shower needs without the clutter. Next door, the powder room delivers the “wow” factor we all want from this type of room. Elegant, welcoming and with unique styling, it’s the perfect statement for adding drama to a small space.